Lenovo's new IdeaPad 710S Plus-13IKB with a 13.3-inch screen diagonal is the Kaby Lake successor of the IdeaPad 710S tested in June 2016. It has to compete with the highly mobile office and multimedia laptops that are summarized in our subnotebook section. 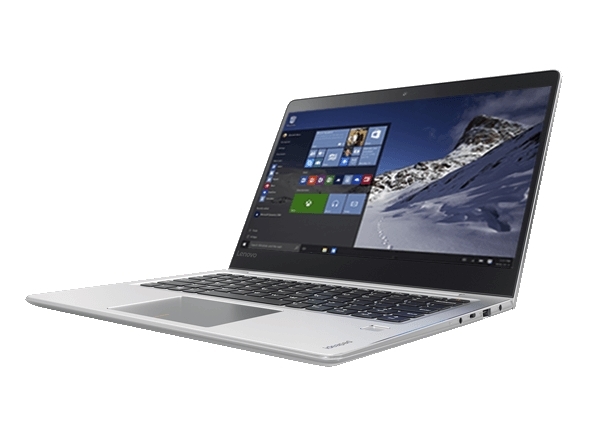 The compact, light and slim newcomer looks a lot like the Skylake-based predecessor. 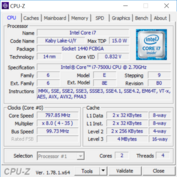 A fast Intel Core i7-7500U, supported by 8 GB of working memory is under the hood of the tested version. Data can be stored on a 512 GB SSD by Samsung. An IPS panel with Full HD resolution is again installed. However, the one here has a reflective surface. 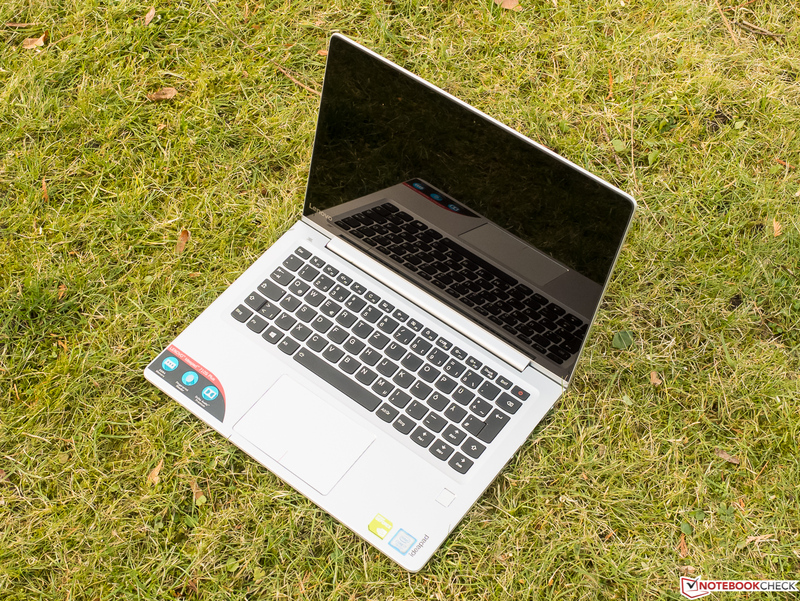 The IdeaPad 710S Plus primarily stands out from the masses with its dedicated Nvidia GeForce 940MX graphics card and its 2 GB of dedicated VRAM that promises conditional gaming suitability. In addition to our 13IKB (80W30048GE) version, priced at 1299 Euros (~$1383, RRP), Lenovo's product website also lists the cheaper 80W30049GE model for 999 Euros (~$1063). It sports an i5-7200U and a 256-GB SSD but not a dedicated graphics card. Differences are not seen otherwise. Attentive readers will perhaps have noticed that Lenovo speaks of an anti-glare panel. This, however, does not match to what we are seeing here. Both versions were 100 Euros (~$106) cheaper in a major Berlin-based price comparison at test time. Acer's new Swift comes with a special feature: According to Acer, its height of not even 10 millimeters (~0.4 inches) makes it the presently thinnest laptop in the world. Apart from a few details, such as a fingerprint scanner and ports, Lenovo apparently has not changed much of anything at all compared with the very convincing predecessor - which is good news. 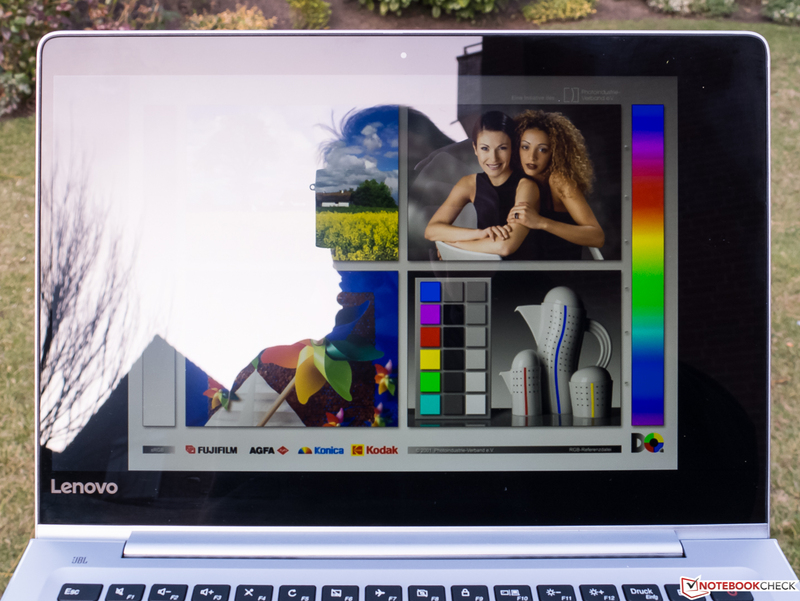 Thus, it may be assumed that an aluminum-magnesium mix is again used as materials although Lenovo does not explicitly advertise this, which is somewhat unusual. 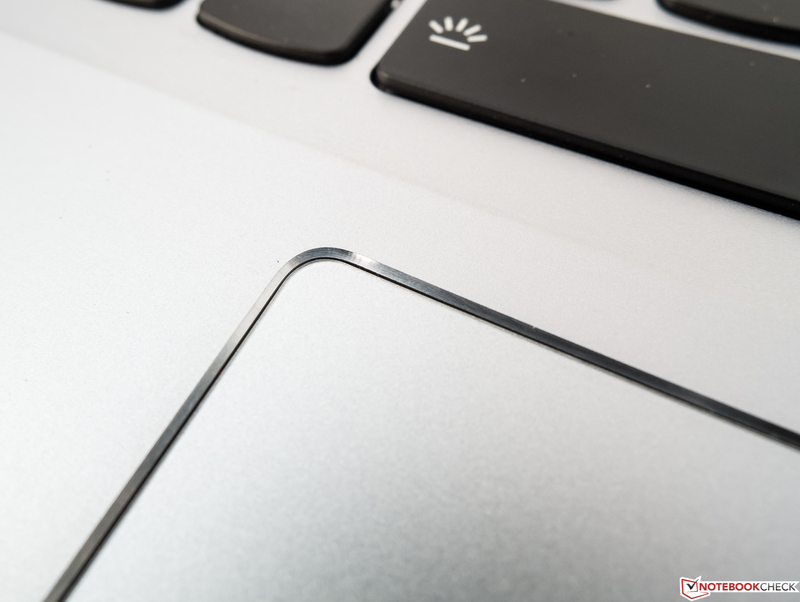 Since we have already pointed out that the design and surfaces follow those of the MacBook Air in the review of the 710S, we will directly jump to build and stability. We believe that the predecessor was a bit stiffer. It is nevertheless enough for a good subscore since twisting is only possible to a very limited degree, and it is then accompanied by only subtle noises. Lenovo has again done a good job with the build; only the gaps of the removable base plate exhibit marginal irregularities. Unfortunately, while slightly less stiff, the lid still requires two hands to open, which is the price paid to restrain annoying rocking. We, of course, again give full points for the design in total, but some subscores of the other aspects will be reduced slightly. HP provides the most compact and lightest laptop in the test with its EliteBook Folio G1 (1.1 kg/~2.4 lb). Our Dell XPS 13 (1.2 kg/~2.6 lb) is not quite as deep but a bit wider. 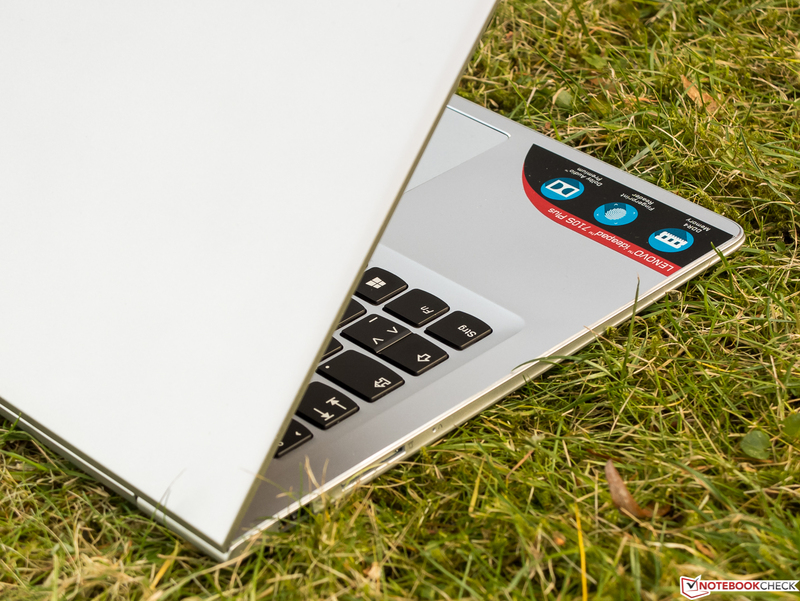 The width and depth of the approximately 1.1 kg review sample, which also has the biggest surface area following the especially slim Acer Swift 7, surpasses both laptops. Dell is the thickest, followed by Lenovo's IdeaPad, then HP's EliteBook, and finally Acer's Swift with a much bigger surface area than the other participants, which is likely the price for the extremely slim build. As is common for compact subnotebooks, not many interfaces are present. At least USB 3.1 Gen 1 Type-C has been installed. This port is also the only possibility for connecting external monitors providing a corresponding DisplayPort adapter is purchased. Thunderbolt 3 is absent. Of the other two USB ports, it is the left-sided port that still operates in the 2.0 standard. Since the majority of users are right-handed, and the port is predestined for connecting an external mouse, the cable has to be routed around the laptop. Otherwise, the port positioning does not give reason for complaint; everything has been installed ergonomically into the back areas of the sides. The spacing between the ports is more than sufficient. 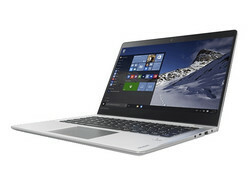 When just looking at laptops with card readers that are not slowed down by USB 2.0, Lenovo's IdeaPad 710 Plus achieves mediocre write and read speeds with our Toshiba Exceria Pro SDXC 64 GB UHS-II reference card. Dell, for example, proves that more is possible. The speed will hardly upset users who do not have to copy a 16-GB card to Lenovo's laptop every day. Matching the mobility claim and the lack of cabled Ethernet, Lenovo relies on a MIMO 2x2 module named Qualcomm/Atheros QCA6174 (802.11 a/b/g/n/ac). It theoretically achieves a gross transmission rate of 867 MBit/s in the less frequented 5-GHz band and implements Bluetooth version 4.1. We are curious about how it will fare after the predecessor was a bit weak here. Considering the unpreventable overhead, the transmit and receive rates of 600 MBit/s using the Linksys EA 8500 are very good. The Killer 1535 module (2x2) in Dell's laptop surpasses them slightly. Lenovo apparently does not have mobile wireless versions in its lineup. The IdeaPad 710S Plus offers a TPM 2.0 chip, and a fast and reliable fingerprint scanner for security-conscious and mobile users. A USB Type-C-to-DisplayPort adapter would only cost a few cents, but Lenovo does not include one. Thus, only the minimum in the form of the power supply and compulsory setup and safety instructions are in the box. 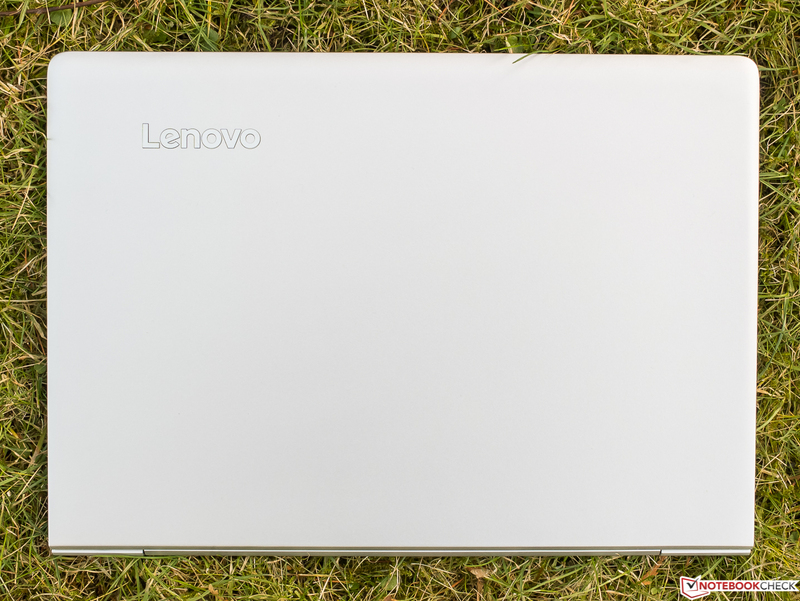 We did not discover any special accessories for the 710S Plus on Lenovo's website. The base plate fastened by ten Torx screws should be easy to remove and allow accessing most components. Since the review sample is a shop device, we did not remove the plate, which could lead to the loss of warranty and guaranty. 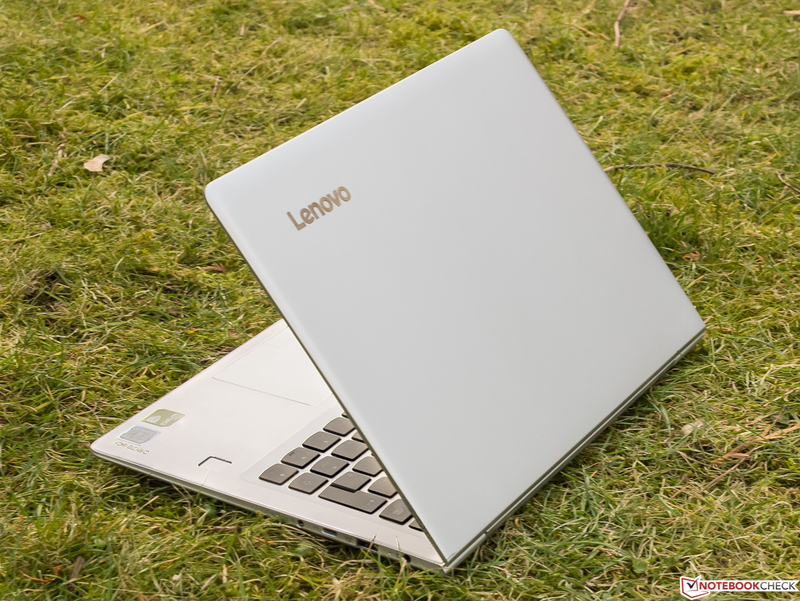 Lenovo offers a 24-month bring-in manufacturer warranty with only twelve months on the battery. The warranty can be upgraded for a charge. Details can be found here for warranty conditions and statement of warranty. Of course, the two-year legal retailer warranty also applies. Please see our Guarantees, Return Policies and Warranties FAQ for country-specific information. The slightly lowered keyboard has not been changed compared with the predecessor. Both the layout and its feel are the same. The black, flat, and slip-proof keys with well-legible lettering have a short drop, well-defined pressure point, and for the tester somewhat too spongy stroke. Besides some keys that are smaller than in standard desktop keyboards, such as CRTL or Enter, the layout does not present many oddities, such as the unusual positions of the keys INS or POS1, and the power button integrated into the keyboard's upper right. 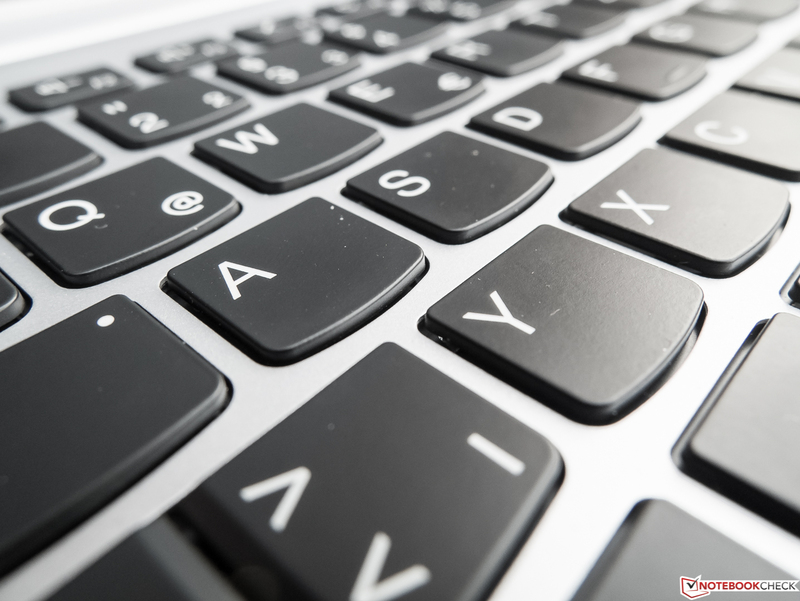 Although the key field is perhaps five millimeters narrower than that of a desktop keyboard, the size and spacing do not thwart touch typing. Again, the build does not give reason for complaint. Like almost the entire upper side of the base, the keyboard can be dented slightly, but the force needed for this will not be applied in practice. The two-stage backlight has to be reproached a little as we would have appreciated a bit more homogeneity. 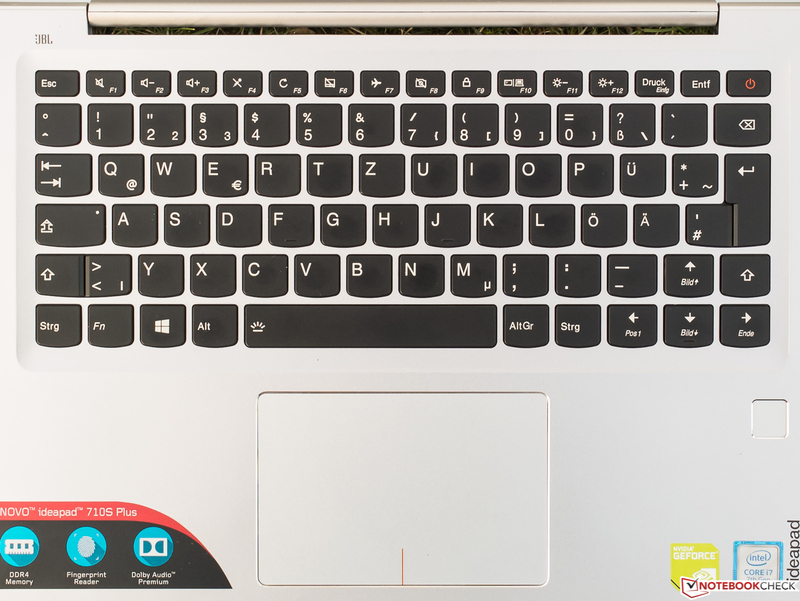 Like the predecessor, the stroke noises of the Enter and especially the Space Bar in the IdeaPad 710S Plus is not suitable for noise-sensitive environments. 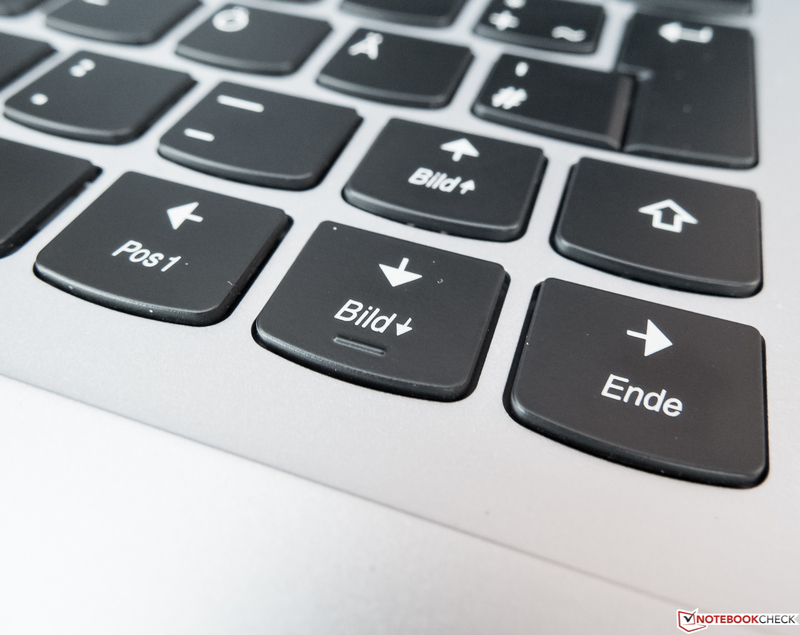 Lenovo has made a minor production error with the "key-less" ClickPad that at least looks identical with that of the predecessor. The pleasantly large surface is not inserted quite evenly everywhere, which could produce a clattering noise when touched (point deduction). Dry fingers glide smoothly over the sleek surface while moist ones sometimes encounter a bit too much resistance. In any case, the gliding properties make a better impression on the tester than the one in the predecessor, which we also considered in the rating. The crisp replacement mouse keys with a short drop are beyond reproach thanks to pixel-accurate precision, impeccable responsiveness, and smooth implementation of drag & drop via double tapping. A glossy IPS panel with a resolution of 1920x1080 pixels (Full HD; 16:9) is installed. In view of the 13.3-inch screen size, a higher pixel density than 166 PPI would not have made sense. The image sharpness is impeccable. 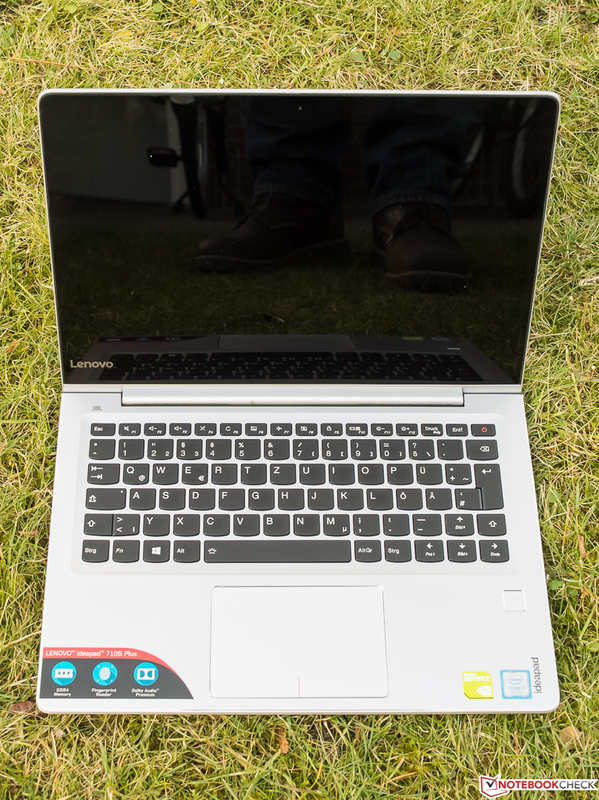 With its equally very good maximum brightness of 306 cd/m², the review sample only manages second place in the field, but the leading Acer Swift 7 is not much brighter. The determined illumination of 81% is below average. When looking at a relatively rich black image in a dark room, the surface makes a mostly homogeneous impression. However, visible backlight bleeding that is noticed in practical use can be seen especially in the lower left corner. Lenovo does not offer any alternative screens. The black level of 0.3 cd/m² is very satisfactory and, alongside the brightness, it results in a very good contrast ratio of 1143:1. 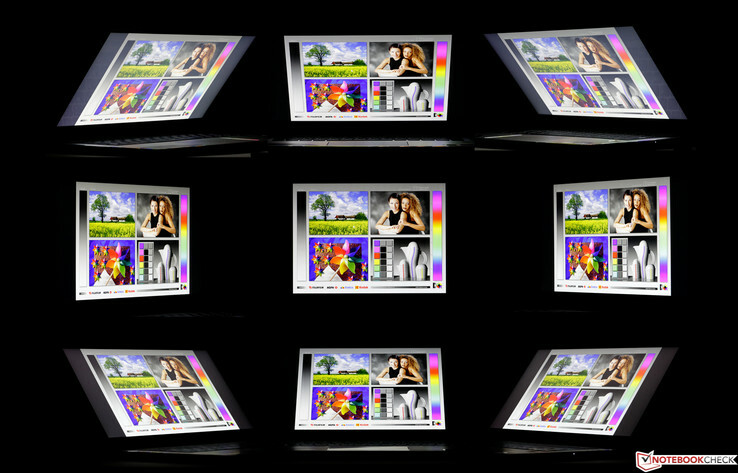 Since the other screens in the test provide similar key specs, the contrast differences are kept within limits. Only Dell's XPS 13 can set itself apart clearly from the review sample thanks to its especially low black level and excellent contrast of 1801:1. With feasibly low color shifts of DeltaE 5 (ColorChecker) and DeltaE 3 (Grayscale) in delivery state the IdeaPad just misses the threshold of serious image editing due to only 54% coverage in the large AdobeRGB color space (sRGB: 83%). This does not permit even halfway serious image editing. 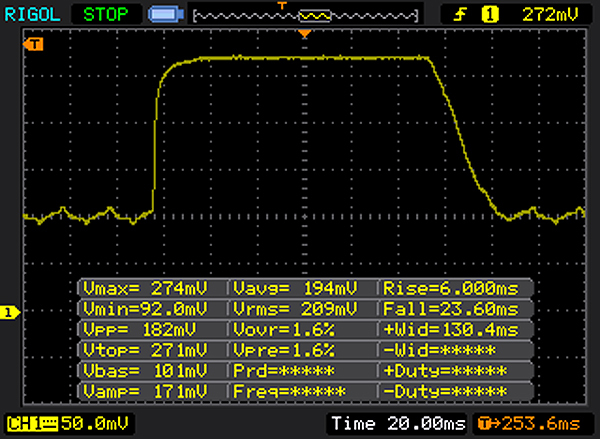 Then again, the low shift from the CCT value of 6500 K is good, and a color tint is absent. 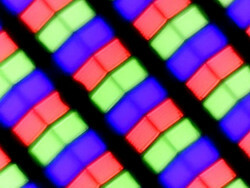 We very much liked the vivid yet not exaggerated colors of LG Philips's panel. An ICC profile that we developed for perhaps slightly improving the color shifts and other things is linked in the box. Anti-glare (as according to Lenovo's website) is not installed. The left screenshot shows that the user will have to make sure that no bright areas, such as the sky, will be reflected in the screen since nothing will be recognizable despite the very good brightness. Even keeping the door in the back (right screenshot) cannot completely prevent the omnipresent reflections, which will likely be even more prominent in the summer. Every IPS panel is superior to any TN screen in terms of viewing angles. However, the quality differs within the technology. The screen in the review sample does a good job, but it does not stand out from the masses of IPS competitors. Thus, a moderate brightness and contrast loss are especially noticed from the sides in very flat angles of 45° and more. Colors do not shift. This did not annoy the tester at all. Kaby Lake everywhere we look - even Lenovo furnishes its new laptops with Intel's new processor generation, and has opted for the fast Intel Core i7-7500U ULV dual-core CPU (2x 2.7-3.5 GHz, Hyperthreading, TDP: 15 W), which still cost almost 400 US Dollars last summer. We mention this because the card in the review sample did not surpass the level of an approximately 100 Euros cheaper i5-7200U in the Cinebench R15 and 3DMark CPU tests. 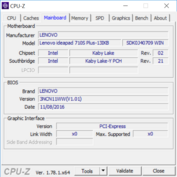 We have dedicated an article to the i7-7500U that calculates much faster in other laptops, and thus we will not go in-depth about it here. 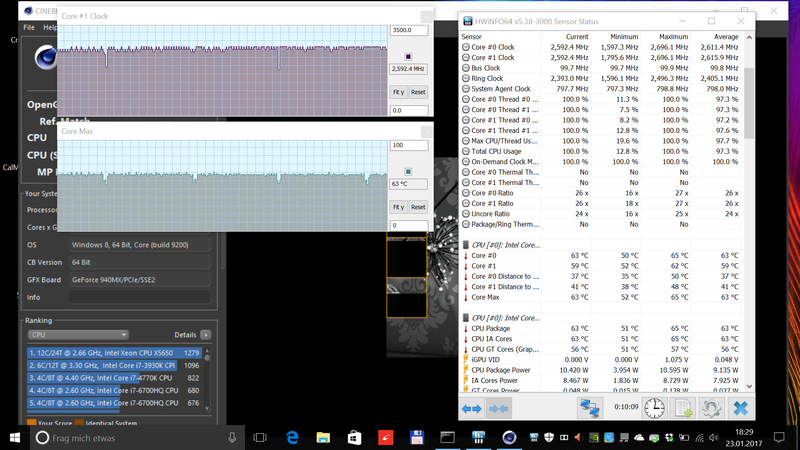 As the right screenshot illustrates, the CPU's Turbo utilization does not look ideal in our Cinebench loop. 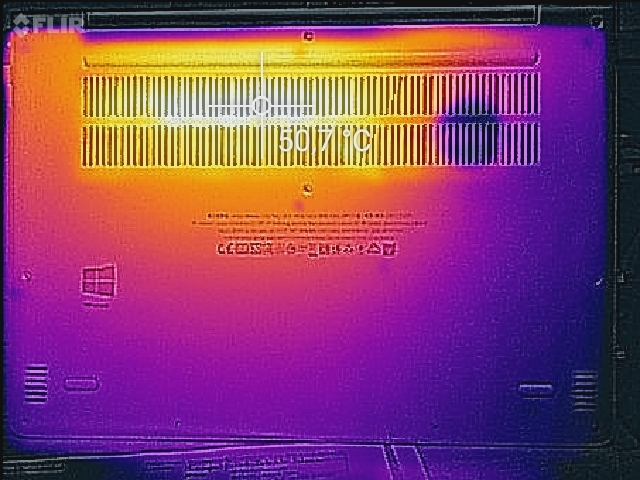 Despite uncritical core temperatures of 65 °C (149 °F) and lower, the clock rates remain at around 2.6 GHz; the average was below the specified base rate after 10 minutes (including breaks). The clock rates fulfill the expectations we have on the i5-7200U with similar architecture, which also fits well to the benchmark outcomes. We generally, and independent of this, recommend the cheaper 710 Plus model when the dedicated graphics card that is only offered with the Core i7 is not needed. 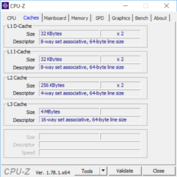 The Cinebench multi-score does not change in battery mode. 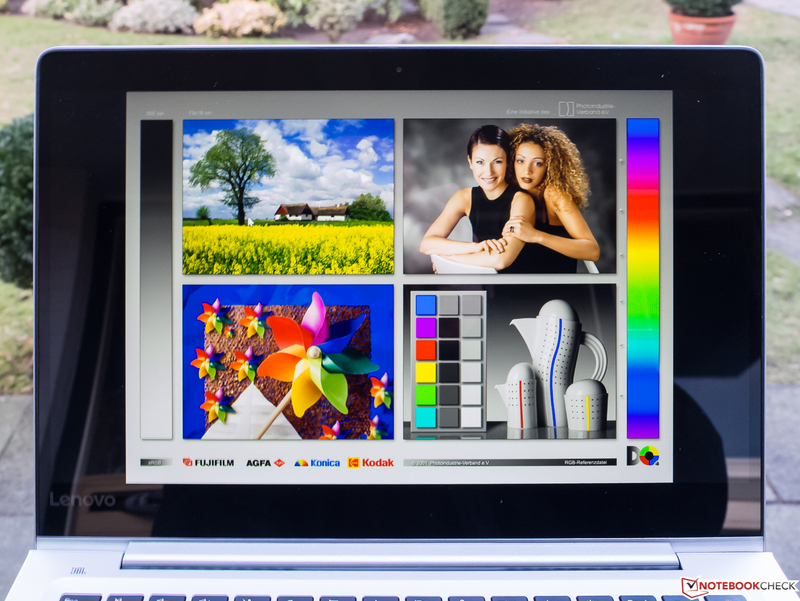 Extreme multitasking and using heavy-duty software, such as Adobe Lightroom, are no challenge for Lenovo's IdeaPad 710S. 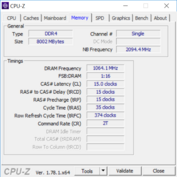 The dual-core furnished with 8 GB of DDR4 single-channel RAM, of course, finds its limits in highly parallelized software used in many up-to-date games that clearly benefit from four or more physical cores. 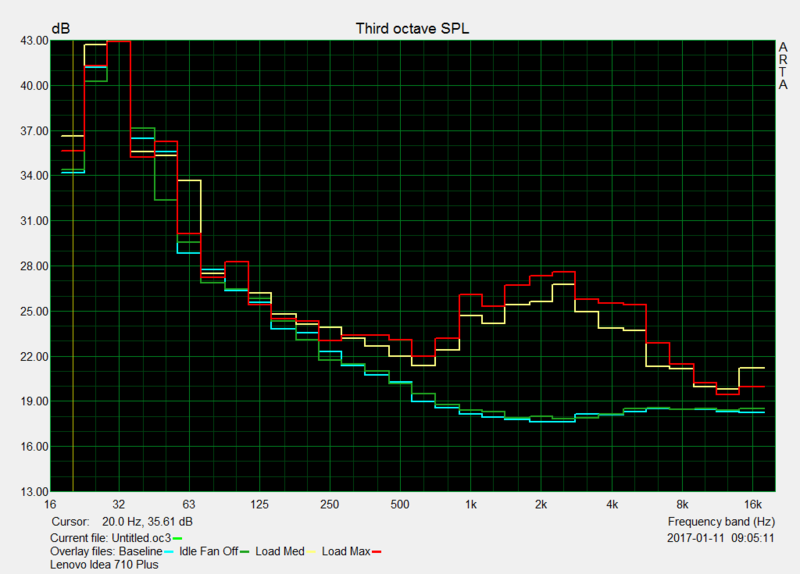 The tester was pleased with the smoothly running system and, thanks to the SSD, fast launching of the OS and programs. 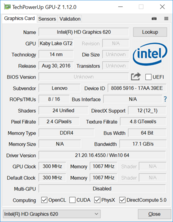 Although Dell's XPS 13 only sports an integrated graphics processor, the nominally slower i5-7200U, an overall weaker SSD, and a lower clocked RAM, it has a slight edge on the review sample in PCMark 8. The fact that Dell's device operates with two memory channels is not enough reason for this phenomenon. In total, all four laptops are very close on a high level, and the subjective differences should be kept within tight limits. Although we now have some even faster SSDs in our database, we can keep things short here: The PM961 NVMe SSD with a capacity of 512 GB by Samsung achieves superb outcomes in all important single tests. 54.8 MB/s is an excellent rate in the 4K read performance, which is particularly important for launching the operating system and programs, and only few SSDs surpass this. The AS SSD benchmark is not listed due to compatibility issues. Of the other SSDs in the test, HP's EliteBook Folio G1 can keep up to the 710S Plus the best. However, as always in practice: the main thing is having an SSD. 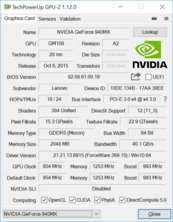 Like its direct Nvidia GeForce 840M and 940M predecessors, the installed GeForce 940MX graphics card is developing to be a basic card used in many laptop models. 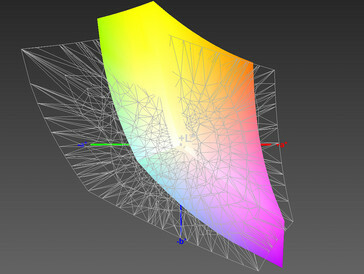 The mid-range graphics card relies on 2 GB of dedicated GDDR5 VRAM, which is connected via a narrow 64-bit memory interface. The 940MX is often accompanied by the slower DDR3 RAM. To make things even more complicated, Nvidia apparently also offers the GDDR5 model with 512 (GM107 chip) instead of 384 (GM108) Shaders and a lower clock rate. 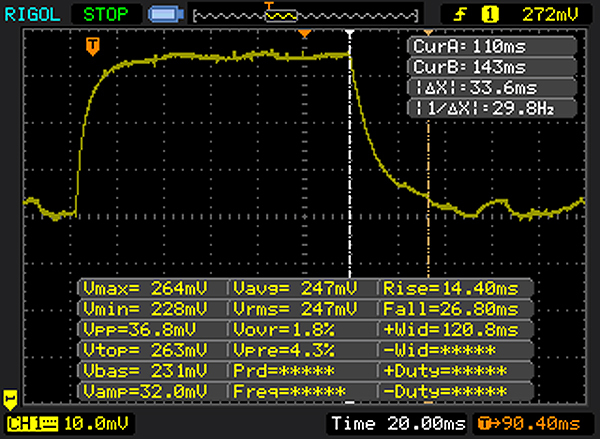 This is normally 1083-1189 MHz (Turbo), but the manufacturer limits it to 954-993 MHz in the review sample. More information about the GeForce 940MX can be found following the corresponding links. 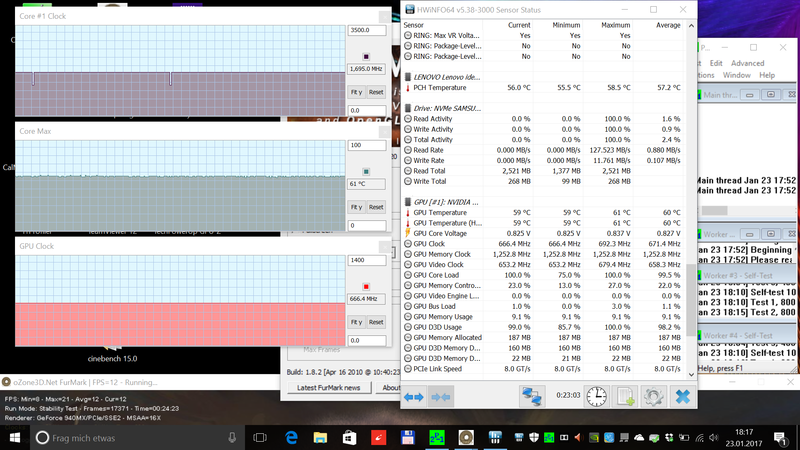 Compared with other 940MX cards (all versions) in other laptops, the performance is midfield in 3DMark 11 and 2013. An exception is the Cloud Gate benchmark where the 940MX in the 710S Plus takes second place. Rerunning 3DMark 11 in battery mode lead to a marginally lower total score that is within the mean variation. Some up-to-date games, such as "Titanfall 2" can still be played smoothly on Nvidia's GeForce 940MX using medium presets and 1366x768 pixels. Other games like "Dishonored 2" do not come close to playability. For newer and graphically demanding games, it is possible to play most of them when using the often unsightly minimum settings and 1024x768 or 1280x720 pixels. Less demanding games, such as the new "Farming Simulator 17" or games with an isometric reproduction (exception: "Anno 2205") even allow high if not maximum ("FIFA 17") presets at 1920x1080 pixels. The card is not suitable for resolutions higher than Full HD. 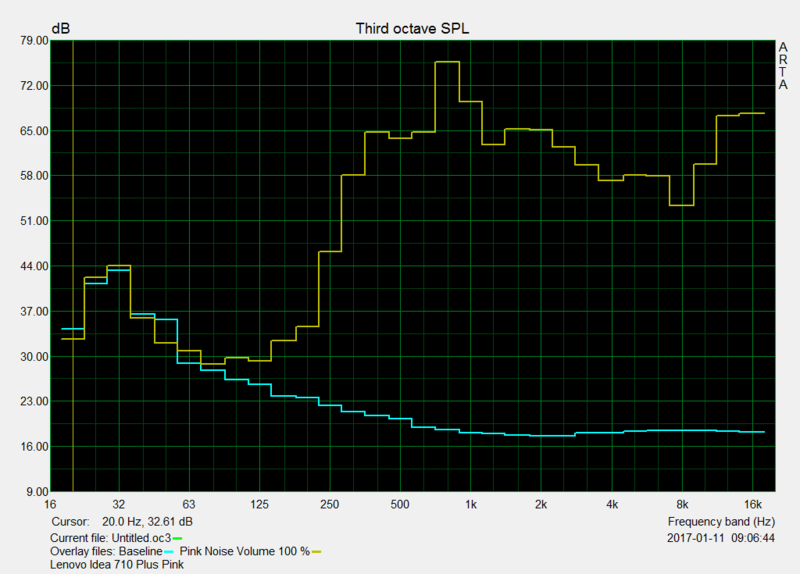 Our measurements confirm that Lenovo's new laptop produces a restrained soundscape. However, this is not true subjectively. The fan is inactive in idle mode, and occasional load (browsing, office) usually does not change that. The fan speeds up abruptly a few seconds after initiating the stress test (Prime95 + FurMark), and it produces a subtle noise a few speed levels later. Unfortunately, a high-pitched, annoying whistling sound that starts at medium speeds actually covers it. Of course, this phenomenon does not have to be the case in every 710S Plus. 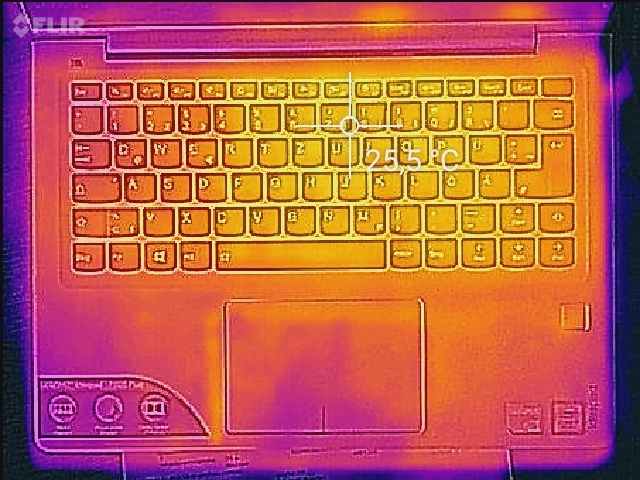 Users who use the IdeaPad 710S Plus on their lap will have to expect a maximum average of 45 °C (113 °F). 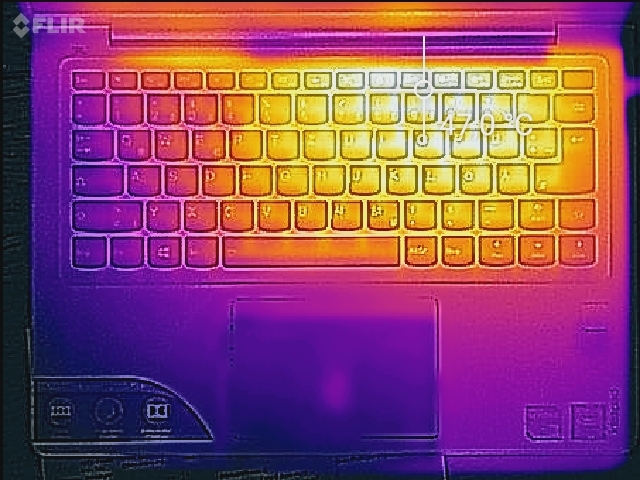 The wrist rests only reach 31 °C (87.8 °F) then. 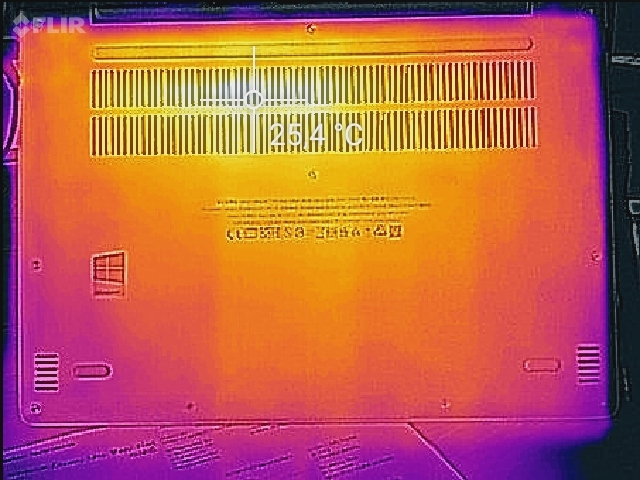 The surface temperatures are not an issue during idle mode or sporadic load. Considering the minor throttling just in Cinebench, we expected even further throttling when performing our unrealistic stress test and we were, unfortunately, not disappointed. Prime95 + FurMark reduce the CPU clock rate to a stable 1.7 GHz and the GPU clock rate to just 666 MHz. However, not even hardware-driven games produce such high and, above all, permanent load, as the anticipated outcomes of the gaming benchmarks proved. 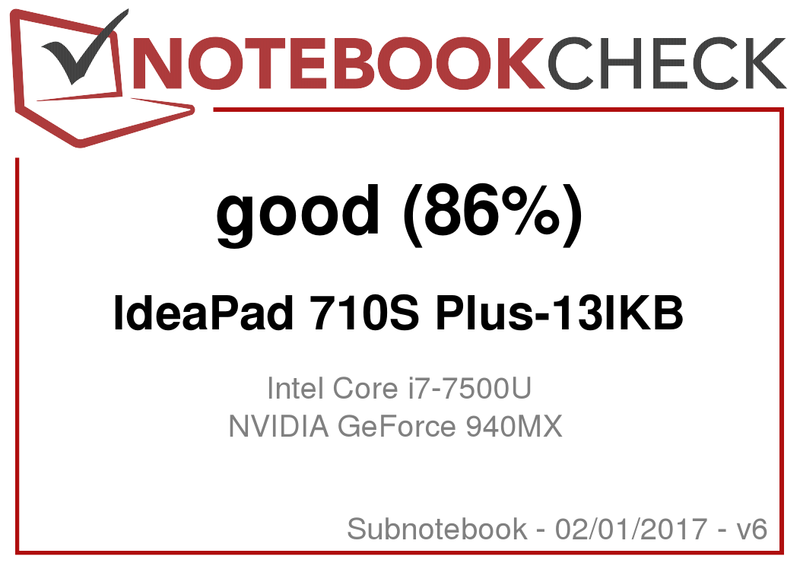 While we were quite happy with the sound of the IdeaPad 710S, we cannot say this about the successor. 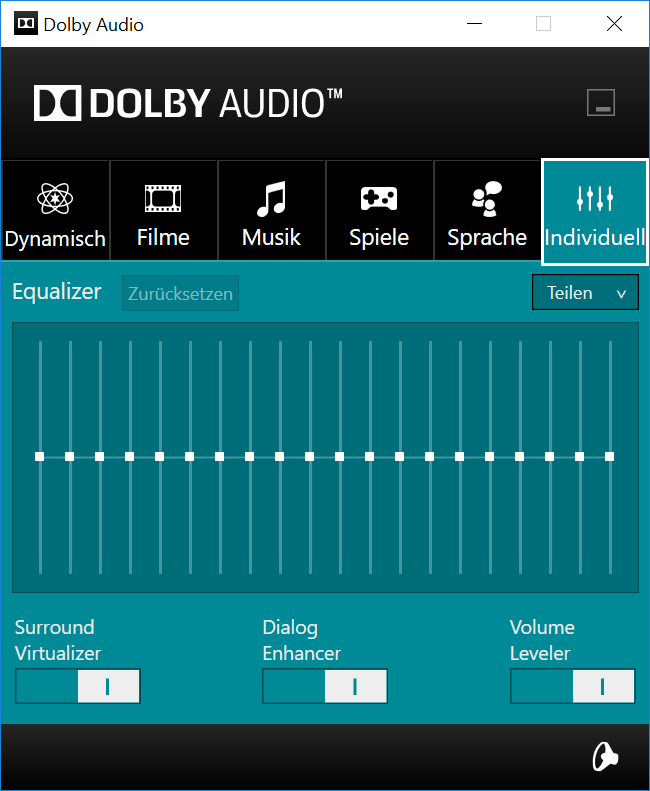 The main reason for this is primarily distortions and the tendency to blend instruments together in high volumes besides the maximum volume that is only sufficient for filling smaller rooms with sound. 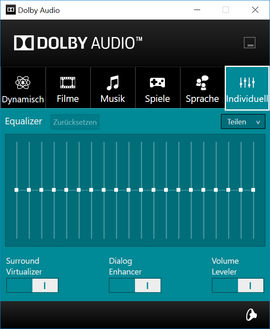 In total, the mid-heavy and low-dynamics sound is more or less unclear depending on the music. 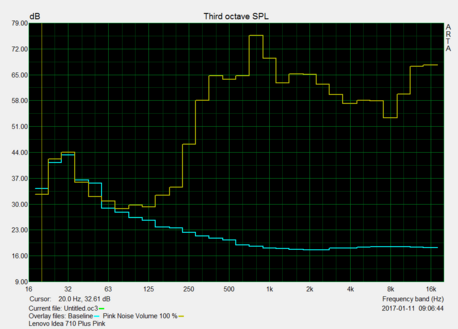 Reducing high volumes is not completely possible without fluctuations. 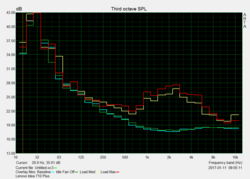 This is too bad since some songs (sometimes) sounded considerably more natural and less compressed than in many other laptops. As our IdeaPad is the only device in the test with a dedicated graphics card, the load outcomes are not comparable. As expected, Acer's Swift and HP's EliteBook Folio based on 4.5-watt CPUs consume less than the review sample in the operating states idle average and idle maximum, but still more than the 15-watt i5-7200U chip in Dell's XPS 13. The review sample scores with the lowest consumption when it is idling (idle min) although the differences are marginal. 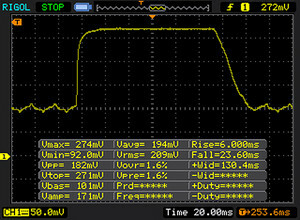 The 65-watt power supply is far from being exhausted. Like in the predecessor, a 46-Wh battery is installed. 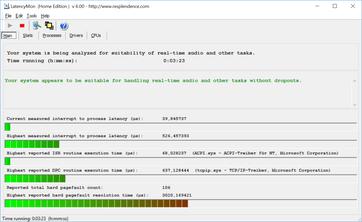 The runtime in the practical Wi-Fi browsing test (Our test criteria) using medium brightness is, however, over an hour shorter. Nevertheless, almost six hours should still be enough to bring most users through a day on one battery charge. Our Acer Swift with its 4.5-watt CPU and no dedicated graphics card sports a slightly smaller battery (42 Wh) and proves to be especially enduring with 19 to 104% longer runtimes. 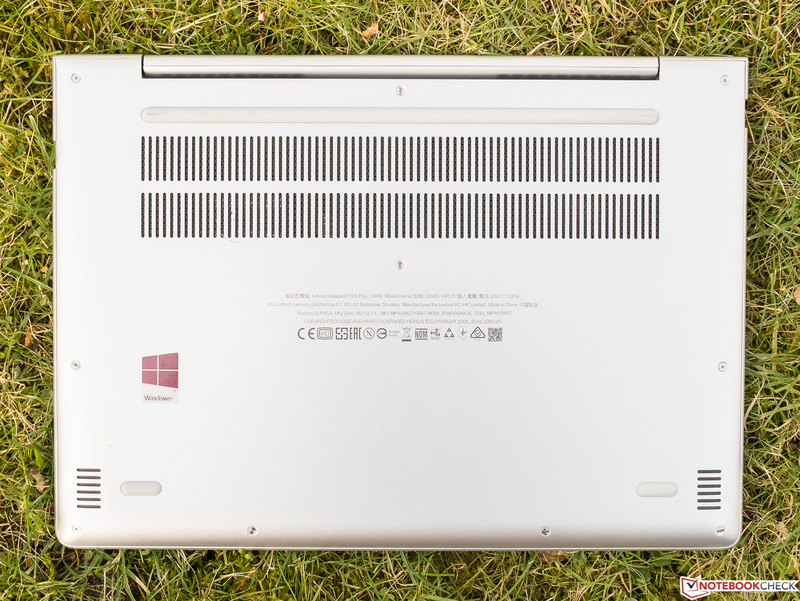 HP's EliteBook Folio also has an overall lead on the review sample despite its 38-Wh battery. 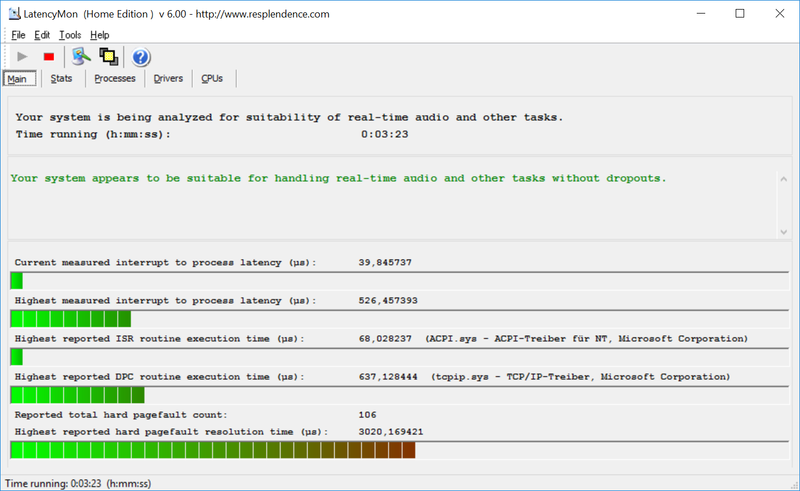 Of course, Dell's XPS 13 60-Wh battery laptop achieves the longest battery life. Unlike its almost perfect predecessor, we discovered some minor manufacturing flaws in Lenovo's new IdeaPad 710S Plus. However, only the poorly installed touchpad will be significant here. The overall superb screen would have been even better with a matte surface and a larger color space. Even if few interfaces are standard in subnotebooks, there would have been room for a scaled down dedicated video out, such as HDMI or DP. The battery life does not quite fulfill the mobility claim, either. The only drawback that could endanger a purchase recommendation is the fan's occasionally annoying whistling, although it should be kept in mind that this will not be the case during slow fan speeds which will likely be the commonest case, and that this could also be an individual case (!) related only to our review sample. Mobility and versatility are the most important properties of the overall very convincing Lenovo IdeaPad 710S Plus. However, potential buyers should watch out for possible fan whistling. Of course, the light yet rigid and very attractive casing has to be listed on the pro side. The input devices should fulfill the needs of most users. TPM and the fingerprint scanner will satisfy security-oriented users, and the slightly clock-rate reduced GeForce 940MX with GDDR5 memory will please casual gamers. In contrast to the predecessor, PWM is not used, the big SSD is lightning fast, and no one will complain about the Wi-Fi performance. In total, we do not want to deny the 710S refresh a purchase recommendation, but we recommend sample listening during load. Users who do not want to play games will probably be better advised with the cheaper version based on an i5-7200U.